Henry can pull himself up to stand now. Once standing, he can’t figure out what to do next, but he is pretty good at pulling himself up. Time to move the crib mattress down lower very soon. Where once the little guy used to just gaze at the animals on the mobile my sister made, he can now reach up and touch and grab them. Henry stands in his crib for long periods of time. This is a relatively new activity that started last weekend. The much anticipated sequel to last night’s “Getting Ready for Bed“. Henry’s Aunt Juj (Julie), and her daughter, Ona spent a lot of time creating a handmade surprise gift for him. Exactly what is was, even we weren’t sure. We only knew that they’d spent a lot of time making it and that it had finally been shipped. So we started getting concerned that their efforts would go to waste when it appeared that the package had been lost in transit. Luckily it was only delayed and eventually made it here intact after a few weeks. As you can see in the photos below (enlarge them by clicking), it was worth the wait. The package actually consisted of three handmade gifts, all with the same theme: MONSTERS! There’s a blanket with patterns on both sides featuring various little monsters, a stuffed monster toy buddy for Henry, and best of all, a hanging mobile featuring multiple stuffed monsters, each one different. 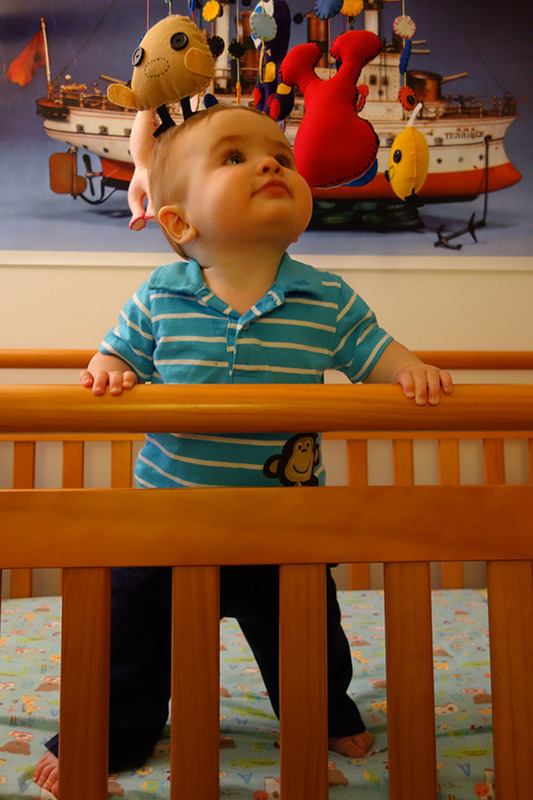 After hanging the mobile above his crib, we laid Henry down and he was immediately fascinated by the odd creatures floating above him. It’s pretty clear he’s going to get a lot of enjoyment out of these gifts and we all appreciate them very much. Thanks Aunt Juj & Cousin Ona! Also: Apparently they made another mobile for Henry’s cousin, Mae – only her’s is bird-themed.